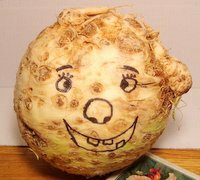 Meet Dobby the Celery Root. Yes, I know -- only his own mother could love him. 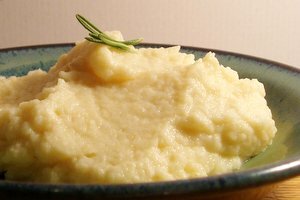 But when mashed with a little cream and butter, not only is he delicious with a little astringency reminiscent of celery, but looks appetizing enough to compete with mashed potatoes. This creamy little side dish is a perfect accompaniment for fish and lighter meats since it's not as ladenly starchy as potatoes. Peel celery root by cutting off its bumpy skin with a knife. It's too bumpy for a vegetable peeler. Cut into 2/3 inch dice. Set a large heavy pot with butter over medium heat. When butter is melted, add celery root. Season generously with salt and mix well. Turn the heat down to medium low, cover the pot, and braise until tender stirring occasionally, about 25 minutes. Add the cream and puree with an immersion blender or in a food processor. If celery root cools too much by the time you are ready to serve it, rewarm in 375F oven. I also make a salad with celery root it is delish. add to bowl. Make a dressing using oil and vinegar some mayonaise , salt & pepper a dash of salad supreme , mix and add to salad eat and enjoy, also if preffered chill a bit in refer. before serving.